I am a very fast food loving person. During college life there was hardly any day I skipped fast food. Be it simple 'phuchka' (panipuri) or heaviest roll, I was always in ! Surprisingly after my marriage I have taken a lot of control over my food habit, I have become more conscious now. But that doesn't mean I can't eat fast food once in a week .. hell I can !  When I made these yummy 'egg chicken roll' last of last week (after a decade) there was simply no alternative to my happiness. I found the taste exactly like those shop's ones what I used to eat during college days. If you are also a fast food loving person then treat yourself with one / two  of these (no one is judging) ! Look at those rolls ... how irresistible they are looking !! 1 Tablespoon of hot red chili powder. For paratha (1.5 cups of flour, pinch of salt, 2 Teaspoons of oil, warm water as required). For assembling (half cup of sliced cucumber, 4 Tablespoons of ketchup, 4 Tablespoons of chili sauce, 1/4th Teaspoon of black pepper powder, 1 Teaspoon of lemon juice). 3 green chilies, finely chopped. 3 rectangular piece of paper. 1 Teaspoon of chat masala. 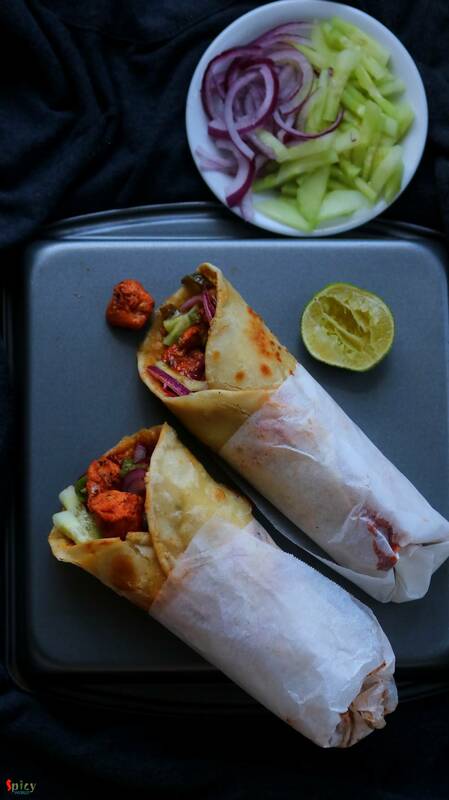 Marinate the chicken cubes with yogurt, salt, tandoori masala, red chili powder and ginger & garlic paste for an hour. In the meantime, take flour, salt, oil and warm water in a mixing bowl. Mix well and make a smooth, soft dough. Knead the dough for 2-3 minutes. Apply some oil all over the surface of the dough and cover it for 20 minutes. In a bowl, add half of the onion slices, chat masala, chopped green chilies and 2 Teaspoons of lemon juice. Mix well and keep aside for 20 minutes. Heat 2-3 Tablespoons of oil in a pan. Add the marinated chicken pieces into hot oil. Fry them on high flame for 3-4 minutes. Then add the remaining sliced onion and capsicum slices. Mix and cook for 2 minutes on medium flame. Then turn off the heat. Beat egg with some salt and pepper in a bowl and keep aside for later use. Now start making 3 lemon size balls out of the dough. With the help of some dry flour and flatten one ball to a medium thin size disk. Then heat a tawa or pan. Place one disk on hot pan and cook for a minute then flip it to the other side. After 40 seconds of cooking, remove it from the pan. 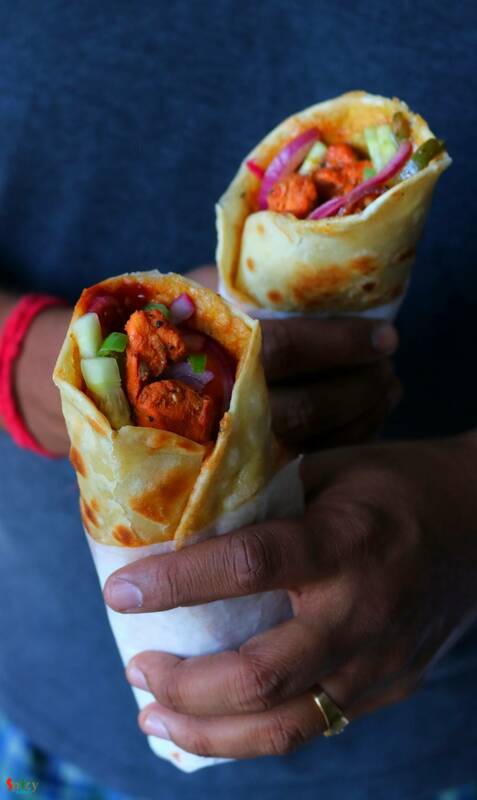 Keep those half done paratha covered aside. Heat 1 Tablespoon of oil in the same pan. Add the beaten egg, after few seconds place one uncooked paratha over the egg. Add another 1 Tablespoon of oil, spread the oil all over the paratha and flip it to the other side. Fry for 1-2 minutes then remove it from the pan. Do the same with rest of the parathas. 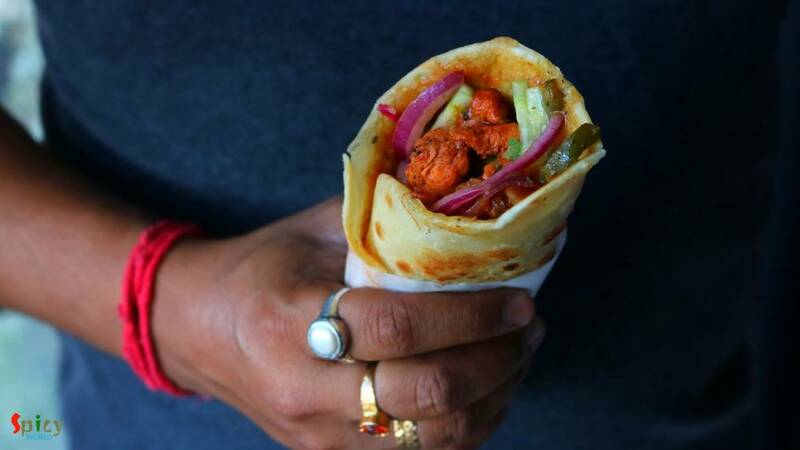 Place one paratha on a plate, assemble some of the cooked chicken, some pickled (marinated in lemon juice) onion slices, cucumber slices, pinch of black pepper powder, few drops of lemon juice, a Tablespoon of chili sauce and another Tablespoon of tomato ketchup. 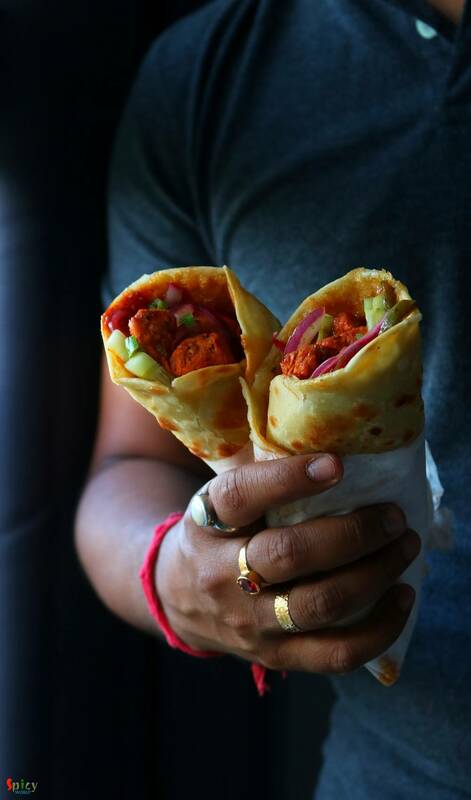 Roll the paratha with the filling tightly. Secure one side of the roll by a paper then serve.